Home Mobile App Development How to Work with ExpandableListView in Android? How to Work with ExpandableListView in Android? Hi readers, welcome to my new post on how to work with ExpandableListView in Android. 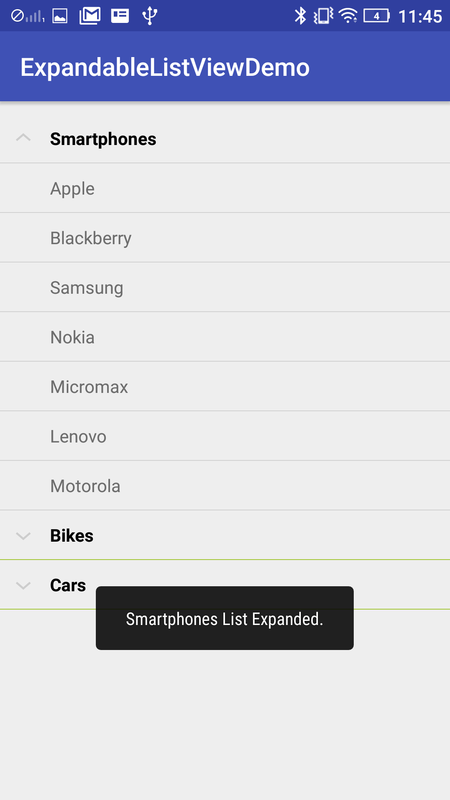 In this post, we are going to know how to create an ExpandableListView in Android. It’s a sort of menu and submenu in ListView. 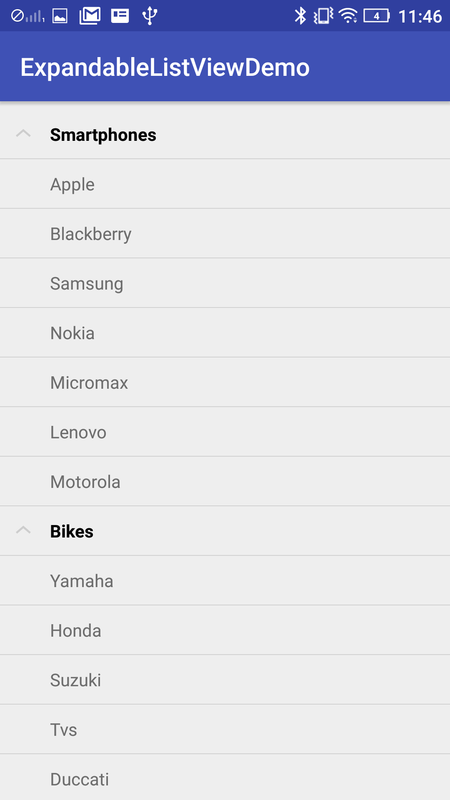 ExpandableListView shows the items in a vertically scrolling two-level list. This differs from the ExpandableListView and ListView by allowing two level groups. 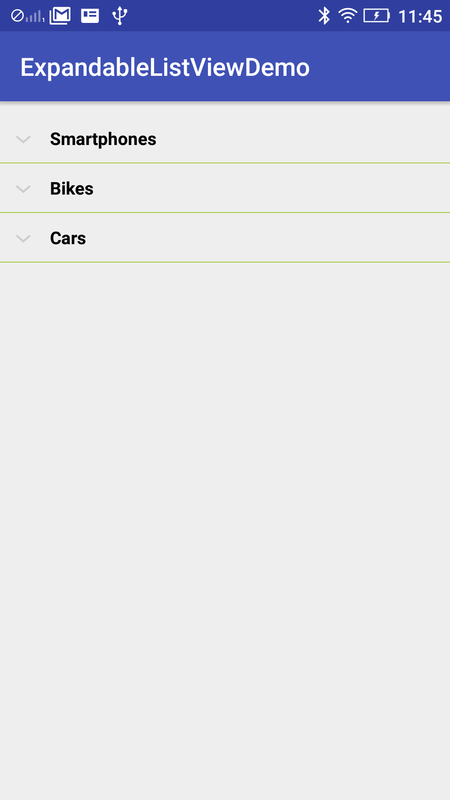 If you have worked with Listview in Android then it’s not difficult for you to create ExpandableListView in Android. 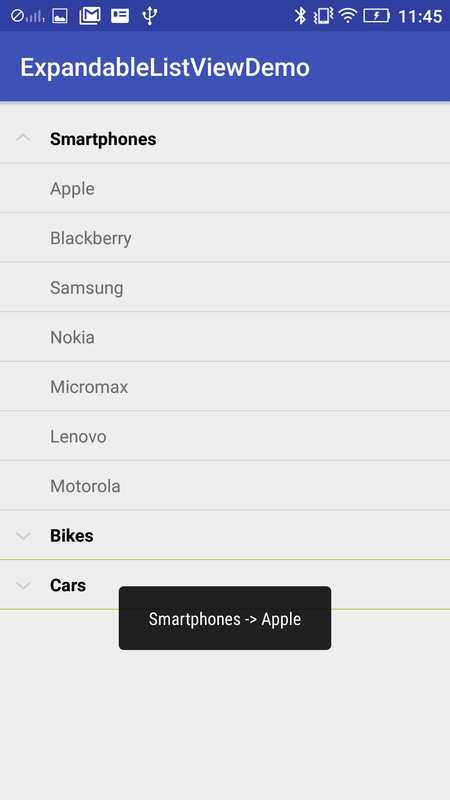 In this tutorial, we are going to display the Smartphones, Bikes, and Cars as Parent Views and their respective companies as child view items. If you want to show more options within the less space then you should go with the use of ExpandableListView in your application. The prerequisites that we need to create the Android Project. 1. Check whether Android studio is installed on your pc or not. 3. A real-time android device (Smartphone or Tablet) configured with Android Studio. 4. The project must be configured to compile against Android 2.3 (Gingerbread) on newer. Let’s start creating the Android Project using Android studio. 1. Firstly open Android Studio on your pc. 6. Minimum SDK: Android 4.4 (KitKat). This will create your Android application Project named as ExpandableListViewDemo. Here is my AndroidManifest.xml file. However, we will create two more layout files First one is for parent.xml and the second one for child.xml for displaying parent and child items. Note: We cannot use the value wrap_content for the android:layout_height attribute of an ExpandableListView in XML if the parent’s size is also not strictly specified (for example, if the parent were ScrollView you could not specify wrap_content since it also can be any length). However, you can use wrap_content if the ExpandableListView parent has a specific size, such as 100 pixels. Firstly, we are creating the ExpandableListView UI which is our main agenda. Open res->layout->activity_main.xml and copy the code as shown below. Here we are creating a TextView for the header in this file. In this file, we are creating the TextView to display the content of child items. 1. We need to create a custom adapter class i.e ExpandableListAdapter class which extends from the class BaseExpandableListAdapter and implement the override methods. 2. The adapter is acting as a bridge between the data and the UI. Copy and paste the below code in ExpandableListAdapter. * Created by abc on 22-Mar-18. LayoutInflater layoutInflater = (LayoutInflater) this.context. This class is used to represent the data object, by using the HashMap object i.e “expandableListDetail” is used to map the child items with their group. 1. However, the interfaces that are implemented by the class are given below. a) ExpandableListView.OnChildClickListener: This method is invoked when we click on the child item. c) ExpandableListView.OnGroupExpandListener: Used for being notified when a group is expanded. d) ExpandableListView.OnGroupCollapseListener: Used for being notified when a group is collapsed. 1.Now open MainActivity.java file in your project and follow the below instructions as follows. 2. At the same time, we need to implement all the interface and callback methods. 3. First, initialize the ExpandableListView as like. 4. Copy the below code and add it to the onCreate() method in the MainActivity class. As a final step before to wrap up, we need to run or build the app either on a mobile device or emulator. Click the run button or shift+F10 in your Android studio to run the app. All the output screens are shown below. 1. This is the first screen we have seen when we run the app either on the mobile device or emulator. 2. When you click on the Smartphone it will expand and show the child items of Smartphone as shown above example. 5. If you click on the child item it will invoke the onChildClick() method in MainActivity. 6. Moreover, in this image, we are showing that all the parent views are expanded and showing the child items. This brings to the end of this tutorial. Now, I hope that you are good at working with the ExpandableListView in Android and you will get benefit from this post. In the meantime do like, share and comment in the comment box below. Thank you! How to make login, signup and user listing in codeigniter? How to work with Services in Android Applications?